The DJIA today gained 23 points, paring gains after the Greek debt talks broke down in the final hours before the European nation falls into default. This afternoon, Germany slammed the door on Greece's last-minute request for another bailout. It would have been the third in just five years. The S&P 500 Volatility Index (VIX), the market's fear gauge, slipped 3.3% today. Global Debt Crises: We're just hours away from a Greek default on its debt to its international creditors, although there is still a chance to ease the possibility of this outcome. Despite a looming default by Greece and the announcement by the government of Puerto Rico that the commonwealth will be unable to fulfill its $72 billion in debt obligations, the flight to safe havens such as gold and silver has been muted. Gold prices eased, falling 0.5%, after the initial shock of both events subsided. Silver prices slipped 0.1% as well. The news is weighing heavily on mining companies. This afternoon, shares of Freeport-McMoRan Inc.(NYSE: FCX) slipped by more than 3.9%. The company has also been drastically affected by falling copper prices as well, as its stock was down 20% over the first six months of 2015. Oil Rises: Oil prices rose this afternoon as Iran was able to garner an extension on its nuclear deadline with Western nations. WTI August oil futures gained 2% to hit $59.49 per barrel. Brent oil jumped 2.6% to $63.83 per barrel. Daily Deals: Merger and acquisition activity continued this afternoon, as financial companies continue to divest assets. This morning, Blackstone Group (NYSE: BX) announced plans to sell its U.S. security services business AlliedBarton for $1.67 billion to French investment firm Wendel. Meanwhile, General Electric Co. (NYSE: GE) announced it would sell its European private-equity finance business for $2.2 billion to Japan's Sumitomo Mitsui Banking Corp. (NYSE ADR: SMFG). Shares of SMFG were up more than 1.4% on the day. On Tap Tomorrow: On Wednesday, a busy economic calendar includes the release of domestic and foreign motor unit sales, the monthly ADP national employment report for the month of June, and the weekly EIA petroleum status report. Companies reporting earnings this morning include Acuity Brands Inc. (NYSE: AYI), Constellation Brands Inc. (NYSE: STZ), General Mills Inc. (NYSE: GIS), and McCormick & Co. Inc. (NYSE: MKC). Stocks to Watch No. 1, PNR: Shares of valve and pump maker Pentair Plc. (NYSE: PNR) were up 6.7% this morning on news that activist investor Nelson Peltz's hedge fund, Trian, has taken a 7.24% stake in the firm. According to reports, Peltz has discussed the company's future with its CEO, and the hedge fund would like to see Pentair purchase several rivals to consolidate the industry. Stocks to Watch No. 2, CAG: Shares of ConAgra Foods Inc. (NYSE: CAG) were up 0.67% after the company reported a fiscal fourth-quarter profit from a year-ago loss, as sales rose 3.7%. The firm also announced plans to exit the private-label industry as it realigns its corporate strategy around its consumer and commercial foods divisions. Stocks to Watch No. 4, KORS: Shares of Michael Kors Holdings Ltd. (NYSE: KORS) slipped more than 2.9% after the fashion retailer said that its first-quarter earnings report will likely underperform. The upscale retailer has fallen for six straight trading sessions. The mid-tier luxury brand is proving that it isn't recession-proof or a defense against a downturn in broader consumer spending. Stocks to Watch No. 5, FIT: Shares of Fitbit Inc. (NYSE: FIT) gained more than 14.4% on news that its new products have outsold the Apple Watch (Nasdaq: AAPL). FIT stock is now up nearly double from its $20 IPO price. Bloomberg's Slice Intelligence reports that Fitbit's wearable technology line – which is more focused on fitness – has been resilient to Apple's entry into the market. The Apple Watch has more general purposes to its functionality. In addition, Fitbit gadgets range between $60 and $250, a discount to the Apple Watch's starting price of $350. 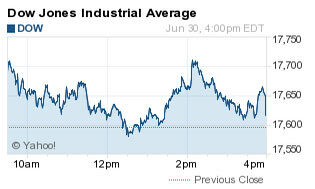 Shares of Apple stock were up 0.7% on the day.